HomeForumD10 D14 and B175 ModelsHELP! Engine siezing? Hi everyone, I need a bit of experienced help here please. I’m very new to the Bantam world and own a D14 that I bought a month or so ago. Yesterday I took it on a short ride and went up a long steep hill in Bath. The engine began to wallow in 3rd at 20 (ish) so I changed down to 2nd. on letting the clutch out (which I probably dumped) the back wheel locked and I I came to a slidey embarrassing halt. I have also found out the bike had new piston rigns from the previous owner. The engine was really hot. I’m worried I seized the engine, or was it a stall on a soggy road? The bike started first kick 30 seconds later and and ran fine going back down the hill. my question is can anyone diagnose an engine seizure? Does this sound like one? If it is have I done any damage? Yes it seized, or as we would say the rings nipped up. More important is why? Could be the timing is too advanced, could be the ring gap is too small or the bike is running very weak. You will need to take the head and barrel off to check whether the piston has burred over and locked the ring(s) in place (& check the ring gap). It is unlikely that you have done anything terminal. Be very careful with the rings, they are brittle. I often break them trying to deburr the piston. I agree with Peter...you need to look at the piston...if the wall is not to damaged if you get a light small file and smooth out the scuffed area. File in the same direction the rings go. You need to take the rings off the piston...but make a note off which goes in which grove and which way up...they need to go back on the piston the same way they came off. Take some pics and post them if poss...if the cylinder has any ali stuck to it you need to get it off or it may cause a further seize. 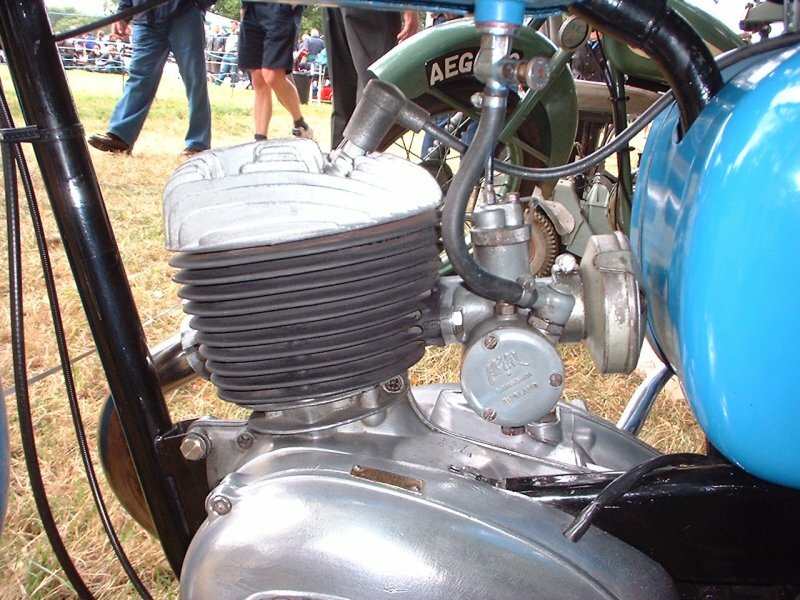 Are you new to 2 stroke engines?? you did put oil in the petrol didn't you?...if yes what ratio. Hi, nick thanks for getting back to me, sounds like a Bit of a project to get the piston out and check it over. Is it worth seeing how it rides on the flat rather than on such a big hill and taking it a bit easier? See if it runs hot normally before getting the files out? My worry is I’ll do more damage than I solve. 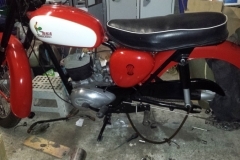 This is is my 2nd 2 stroke out of 4 bikes I’ve owned and I have put oil in the petrol at 25:1 (yes I know that’s not right these days) but the siezure was on the way to the petrol station so god knows what was in the tank before hand. thanks very much, really appreciate the advice. All I can say if it were mine I would strip it before I run it again. Not much work involved...if those rings are to tight a fit as they may not have been gaped correctly you may end up needing a re-bore and new piston. Of course as Peter says it maybe running with a weak petrol air mix...this make them run to hot. If you take out the spark plug and look at the ctr electrode this can be a guide...if its whitish its to weak...if its a tan colour its fine...if its black it maybe to rich...white ir light is not good. They should not seize if all is ok. 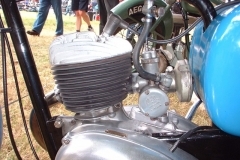 Whip the front pipe off using a C spanner and have a look at the piston and rings/grooves. Seizures generally occur at the hottest point, namely near the exhaust port. After you`ve turned the engine over and checked that out, put piston at BDC, shove a plastic screwdriver handle on top of the piston(for safety), and poke your finger in and feel around the bore, mind it may be sharp...if your fingertip will reach. If things look/feel suspect then remove the head and barrel. ...You will need to take the head and barrel off to check whether the piston has burred over and locked the ring(s) in place (& check the ring gap). It is unlikely that you have done anything terminal. Be very careful with the rings, they are brittle. I often break them trying to deburr the piston. I agree - it isn't a big job to remove the head and cylinder, even if there is no damage visible afterwards. On the other hand, the rings may have nipped-up or other problems spotted. Your choice, though. Yeah I agree with you both, I’m tempted to run it tonight to see how it’s getting on ( as I’ve already ridden it post siezure anyway) and I’ll start taking the head off to see what the situation is inside. As I go I will photograph and post as if I’m honest ... I won’t know what I’m looking at! appreciate your help, in terms of plug colour I cleaned in earlier in the week and before that is was a light coating of dark coloursing that wiped off. No whites anywhere. If you change nothing then nothing will change. If it has overheated and siezed up once then it will do the same again and again until you get it resolved. You will always have a doubt in your mind. So a top-end strip down, expert inspection and perhaps some remedial work is the right way to go. The major problem with the D14/4 was its overheating but if the top end is put together correctly and all set up properly it should be fine. Incorrect piston and ring clearances. Badly machined and finished rebore ( radiussing of ports !!). If you feel a bit over faced by this then I am sure there is as club member closeby to you, with some tools, who can help - where are you located ? Hi, if you find any damage in the bore, I am not sure where you are located but I have a glaze buster you could borrow it might just do the job if the bore has light scuffing. Regards Basil. I think your right, I’ll get it striped and see what’s going on in there. I’d love help from a more experience owner if anyone is in my area , I live in central Bath. reading the possible causes, my bike has potential for all of them! I would probably put money on the rings not being gapped. You state it had new rings fitted. I assume everything else was left untouched and the bike probably ran ok before. 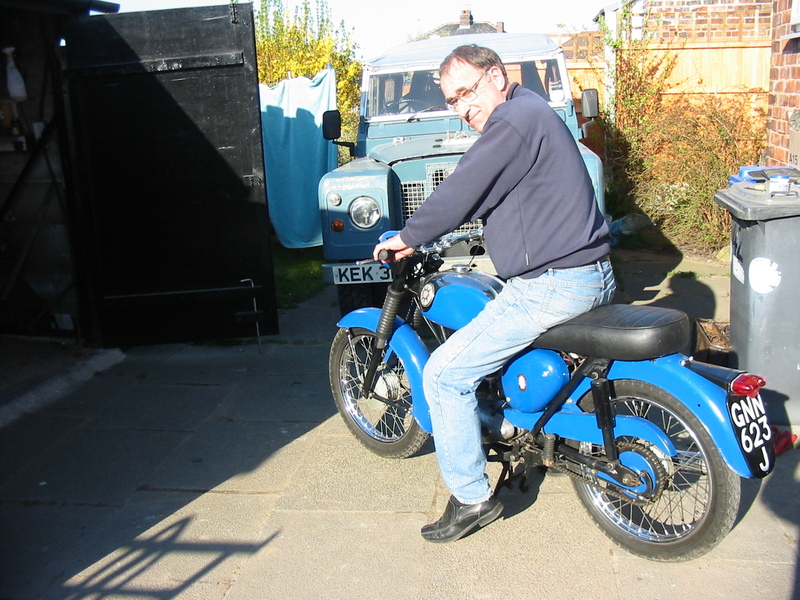 Many years ago I had a rebore done and a new piston fitted. I never gapped the rings and the bike seized up after about 3 miles; started again after a couple of minutes and then seized again after a few miles. The place who did the rebore asked me if I gapped the rings. I said no and I wont repeat what he then said to me! 5 minutes with a file when the barrel was off and all was ok. Important to check the mixture, timing etc just in case. However the mixture is set for the majority of running by the throttle slide and needle position. At full speed the main jet comes into play and at tick over the pilot screw setting is the only thing you can adjust. thanks again to to all those offering help, especially from Shaftesbury, I’ll PM you when I’m preparing to take it apart and maybe give you a call. a few people mentioned the plug previously so I took a photo of it last night. 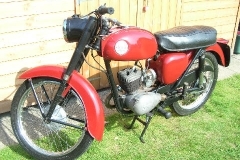 Having spoken to the seller it turns out this engine was rebored aswell as having new rings. Definitely makes me think that you need to get the top off this thing and have a look. If it was re-bored then it would also need a new piston as well as rings etc. No new piston mentioned, unless I missed it. Careful running in is required after a re-bore but it still shouldn't sieze. 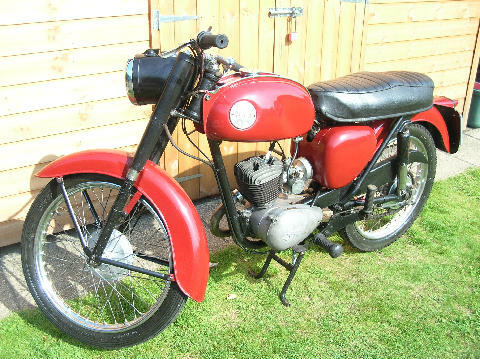 I, also, note a suspicious line of soot on the bottom of the thread of your spark plug - any chance you can send a picture, close up of the engine top end - head, cylinder barrel, carb and exhaust pipe - this may yield some clues. 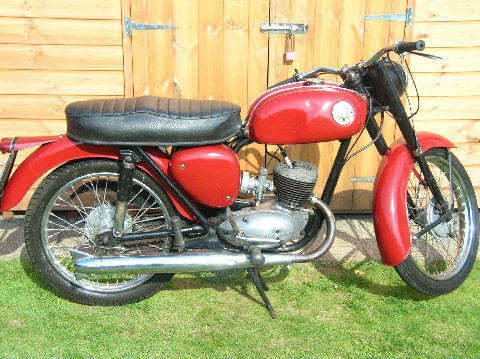 I do hope that you can get this sorted out - it looks to be a lovely bike and I guess it will be re-assuring to you when you know what you are dealing with. I really appreciate the help on this, I did think the blackness on the thread was odd, I assumed a symptom of my 25:1 mixture. 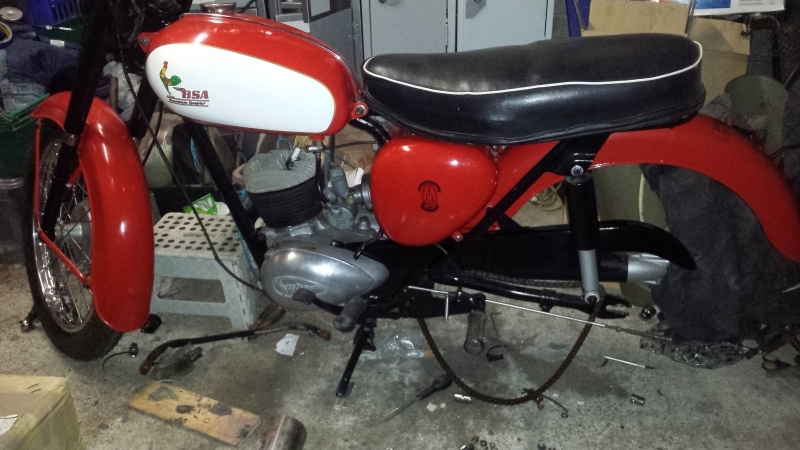 next time I’m working on the bike I will take detailed photos of the top end from various angles and post them to Thisbe thread. I’ll also whip off the head ignore I get time and do the same. You are right its it’s a lovely machine, if not a little rough round ge edges, that I’m enjoying without having to ride it which is brand new for me having come from modern Japanese bikes. itll get sorted even if it takes a while, once again thanks very much for the help. The blackness on the thread makes me think you might have a short reach cylinder head and a long reach sparkplug. Would not help combustion. Its worth checking, and not the end of the world, easy to rectify but it adds clues to the puzzle. 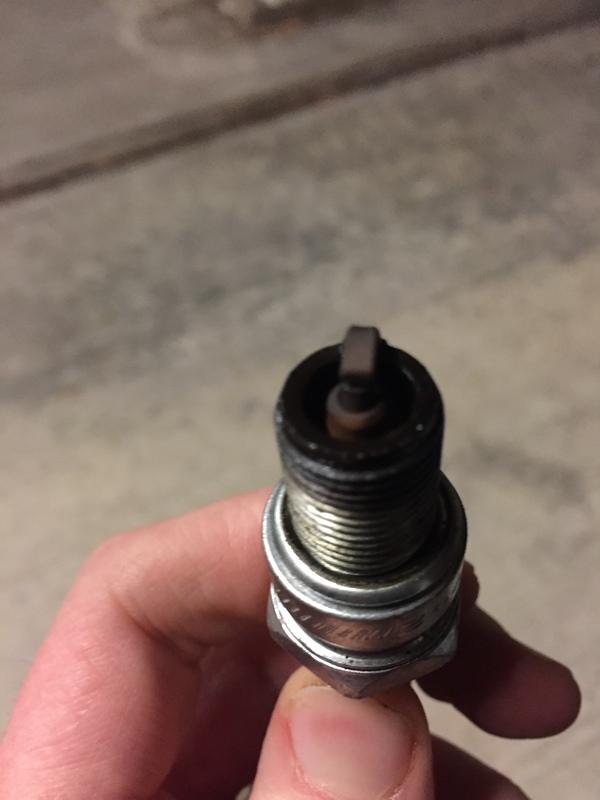 looking at the black portion of thread on the spark plug suggests to me that you have the correct long reach plug for the D14 but the wrong short reach head, possibly D7. This would make the plug stick out too far into the combustion chamber. 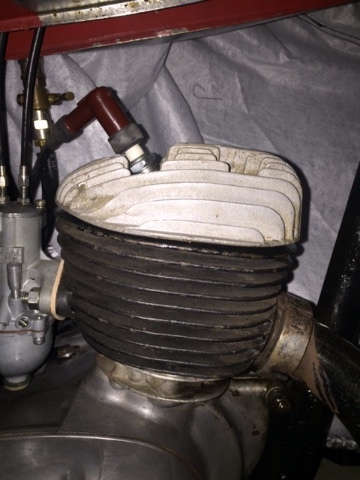 A D7 head on a D14 with the correct D14 domed piston will also give you a massive compression ratio, much too high, which will cause overheating. You need to get the head off that engine as soon as possible, only four nuts, and see how far the plug protrudes. 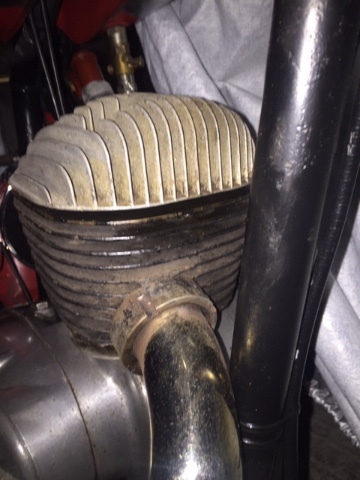 A D14 head has a chamfered squish band, the D7 does not.If you are not sure what you have, post photos on here showing the underside of the head with the plug showing and also the piston crown. Almost certainly you will have deposited piston ally onto the cylinder wall near the exhaust and almost certainly smeared ally over the rings causing them to stick in. It may well still run, but not as well as it should do and probably not for much longer. I have seized several Bantam pistons on different models, for various reasons over the years and there has been damage every time needing attention. And, I will probably get shot down on this, but whatever your choice of oil, keep it at 25:1, at least until you get this engine running seize free for several hundred miles. Keep us informed. 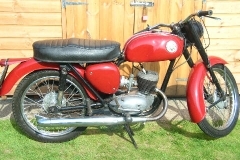 1951 Bantam D1 125, 1954 Bantam bitsa, 1970 Bantam B175, all Bantams on the road and ridden regularly, 1995 Yamaha Diversion 900 and 2016 Honda Integra 750 scooter. Horses for courses, all very different to each other, but a bike for every occasion. As well as all of the above I would check you have no air leaks. I am fitting a cylinder head temperature sensor to mine at the weekend (time permitting) as my engine is largely untested in my ownership and the little devices proved to be invaluable when tuning 2 strokes. If the temperature rises too much but there is no sign of weak mixture then it may point to a timing issue. 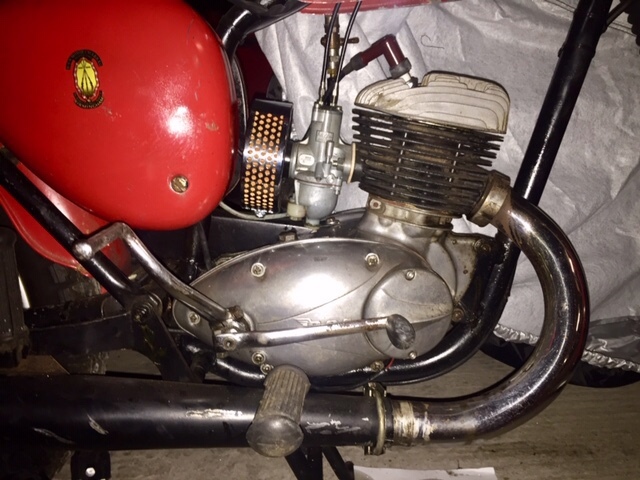 Thanks for the help everyone, I will take the head off the cylinder as soon as I get time, in the meantime here are the photos discussed earlier by sponge. does his give any clue to the version of cylinder head in use?